As colony collapse disorder takes its toll on honeybees, native bees draw attention as an insurance policy for future food security. December 19, 2013 — Over the last decade biologists, citizen scientists and others have fanned out across the United States and parts of Latin America to detect the presence of native bees in the landscape. It’s an effort by the U.S. Geological Survey to get a sense of the overall health and status of native bees, some 4,000 species of which are known to inhabit the U.S. After visiting 100 parks and various wild lands (places that can serve as refuge to bees, away from the stressors that appear in cities and on farms), cataloging bees, wasps and other species they interact with, the group has evidence suggesting native species are surprisingly robust, despite the downward trend in pollinator populations on the whole. Hardy native bees abound on public lands, while others continue to hang on in cities and farmlands altered by human activity. This is a bright spot amid the dire news heard recently about domesticated honeybees — the demise of hives due to an onslaught of environmental and biological threats. Though wild bees face adversity from the loss of habitat and exposure to pesticides, the phenomenon affecting domesticated bees known as colony collapse disorder does not affect native bee species. But not much else is known about native bees. “We’re lacking a lot of data,” says Sam Droege, director of the USGS Bee Inventory and Monitoring Lab, a fact confirmed by a recent report published by the Congressional Research Service. A lack of long-term population data or knowledge of native bee taxonomy makes it very difficult to determine with certainty if native bees are fading from the landscape. According to the U.S. Department of Agriculture, bee pollinators add an estimated $15 billion to crop values per year to the U.S. economy. That’s one reason the USGS established the Bee Monitoring and Inventory Lab in 2004. Droege was asked to create long-range surveys of bee populations to determine whether native bees are in decline, and that depends on the ability to identify them in the first place. 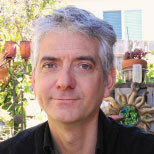 While native bee numbers, ranges and interactions with honeybees are all pieces of a puzzle that conservationists and scientists have been trying to put together for a decade, there is a sudden sense of urgency with news of honeybees’ demise and the decline of bumblebees (which have been studied more than other native species, according to Droege). Piecing together that puzzle will be key to developing comprehensive bee conservation strategies. 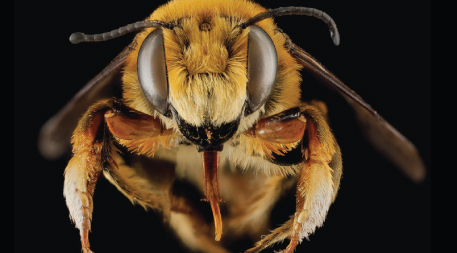 One part of the conservation effort is a database currently containing approximately 1,400 high-resolution images (though more are continually being added) of bees and other species they mix with in the wild that the biologists and scientists mentioned above have sent the USGS, which is only a tiny fraction of the 250,000 specimens in the agency’s vast collection. The images were made using a macro lens at the bee lab in Maryland — capturing remarkable detail — and are used in guides and for identification purposes. Determining the health and status of native bee populations depends on the ability to identify them in the first place. That’s why Sam Droege created a database of bees and other species they mix with in the wild that biologists, citizen scientists and others have sent the USGS. See more of these images. Unlike honeybees, most native species lead solitary lives. Some occupy nooks and crannies in the landscape, such as hollowed out logs, or burrow into the ground. The vast majority of native bee species pass unheeded or undetected by humans. Scant attention has been paid to them, despite the urgency surrounding CCD. Currently their domesticated counterparts, along with other pollinators, pollinate approximately 30 percent of the world’s food supply. In the U.S., honeybees pollinate apples, almonds and citrus crops, to name a few. According to the U.S. Department of Agriculture, bee pollinators add an estimated $15 billion to crop values per year to the U.S. economy, with countless farm workers directly dependent on the harvest for employment. Native bees, for their part, participate in pollinating 70 percent of the world’s flowering plants and along with other native pollinators, add an estimated $3 billion in economic value per year in the U.S., according to the Xerces Society, a nonprofit group specializing in invertebrate conservation. Worldwide, 20,000 bee species inhabit every corner of the globe where plants flourish. Combined, they are more likely to withstand disease and climate change than the lone honeybee. A 2002 paper in the Proceedings of the National Academy of Sciences noted that “native bee communities might provide an insurance policy” against honeybee shortages and therefore could be used to secure the future of food production. The Xerces Society heeded the message. In recent years, the society has partnered with the USDA’s Natural Resource Conservation Service and universities to educate stakeholders on the benefits of native bees as pollinators. And since 2009, it has trained 26,000 farmers and land managers on ways to enhance native bee habitats, publishing evidence-based guidelines on various ways farmers can attract native bees and other beneficial insects to their land and, as a result, also mitigate or reduce pesticide use by attracting small predators, such as flies, wasps and beetles that consume pests known to infest farmers’ crops. Worldwide, 20,000 bee species inhabit every corner of the globe where plants flourish. Combined, they are more likely to withstand disease and climate change than the lone honeybee. Mace Vaughan, a pollinator specialist at the Xerces Society, stresses the advantages of promoting bee habitats — from increasing crop yields to boosting plant and animal diversity. According to Vaughan, CCD has served as both a warning and a wake-up call. “We really need to be looking at what’s going on with our native bees, because they’re facing most of the same stresses [as honeybees],” he says. Promoting a greater awareness of the environmental services native bees provide and creating bee-friendly habitats are necessary first steps. The aim is to boost pollinator populations and protect native species to ensure the future of farming. Recent findings reported in the journal Ecology Letters support a move toward greater conservation. In Europe, where bee species have been more closely studied for a longer time, the decades-long decline of pollinators has slowed, the study notes, and in some instances wild bee populations have been on the uptick due to changes in farming practices. In addition, earlier this year the European Union voted for a two-year ban on three commonly used pesticides linked to bee deaths, which went into effect this month. All of this is encouraging news for conservationists, and perhaps even better news for bees. With some human intervention in the right direction, native bees (at least) might be just fine. Check out “The Wild Ones” on Ensia, a photo slideshow of some of the species included in the Bee Monitoring and Inventory Lab’s database. Great article. Thank you for spreading the word about the importance of native pollinators and the native plants they depend on. Native Pollinators are so important - Thanks for spreading the word!! Thanks for focusing on solutions. If we can steward wisely, we'll continue to witness subtle changes in the proper direction! Thank you for this article. I have long thought that the use of chemical herbicide and fertilizer could not be good for plants, insects, animals and people. This year I purchased seeds from the Seed Savers Exchange, and am looking forward to growing, sharing and eating tomatoes that have flavor. I am 73 years old, people believe me when I say that the tomatoes we are purchasing in the markets do not taste anything like those I ate when I was younger. Whenever possible, I will be growing heirloom varieties of vegetables. I plan to encircle my garden with plants that attract native/natural pollinators. I always have native bees around, then again, I have never used pesticides. I also have a diverse garden. The reason farmers need bees brought in is that the kill everything around with pesticide. Their endless stupidity is likely to result in mass starvation. Grow a garden. No poisons. Compost. Your life may depend on it. Where honeybees hive making for ready containment, transporting, and placement, native bees are a nice back-up but lone workers may be more difficult to draw in and place in numbers where needed. I'm not an expert but I think we better make sure we save the honeybees. We've developed MEADOWSCAPING FOR BIODIVERSITY, a three-season, project-based, outdoor environmental education program for middle school students. Meadowscaping for Biodiversity, with its creative and aesthetically pleasing product, i.e., a sunny meadow, is a generative program, paying a solution forward to the next generation by inspiring, engaging, and empowering students to be problem solvers and stewards of the earth.